Shridhar was a very devout devotee of Ma Vaishno Devi. Once Ma took the form of a girl. The girl asked him to organise a big feast for the devotees of Vaishno Devi Shridhar agreed and went out to invite people. He also invited Bhairav Nath, a sage, who asked him how he would make the arrangements. On the day of the feast three hundred and sixty people were invited and ate in his small hut. Bhairav Nath was surprised by the divine powers of the little girl and he followed her to the Trikuta hills. For nine months he kept searching for her everywhere but couldn't find her. Then, one day he saw the girl proucing water from a stone by shooting it swiftly with an arrow. On seeing Bhairav she entered a cave. Bhairav Nath quickly followed her into the cave. With a trident she opened a path on the other end of the cave and left the cave. But Bhairav adamantly continued to follow her. 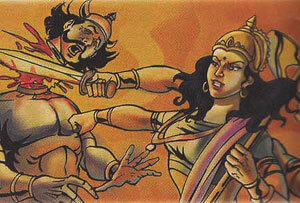 Finally, she took her real form and cut off Bhairav Nath's head. Due to his powers, his head died but body remained alive. He begged the goddess for forgiveness. She not only forgave him but also gave him a boon that the devotees who would come to worship her in her holy cave would visit his temple thereafter. Later a temple was built at the place where Bhairav's head fell.